So your dentist in Alexandria told you that you need a root canal. And you’re a little bit scared because, let’s face it, a root canal doesn’t sound like much fun. After all, everything you’ve ever heard about root canals make them sound painful and scary. Root canals have had a bad reputation for years, but we’re here to set the record straight. First and foremost, your root canal treatment will begin by numbing the area. It may take just a few minutes for the numbing agent to take effect, but once it kicks in, you shouldn’t feel anything. After you’re nice and numb, your dentist in Alexandria will make a teeny, tiny hole in the infected tooth, allowing access to the inner tooth (known as the pulp chamber). This is where the root canals are located. Inside the root canals you’ll find pulp, nerves, and blood vessels. 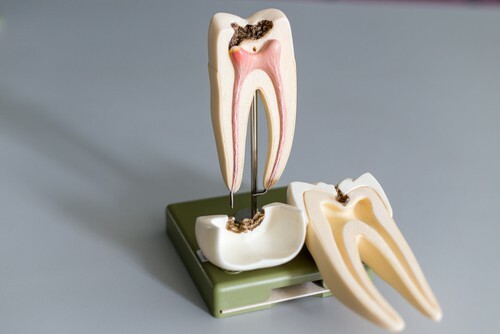 These inner workings of the tooth are removed, alleviating any feeling in that tooth. Your dental team will then thoroughly clean the area and seal the canals to keep anything from entering. Lastly, the tooth is capped with a dental crown restoration to further protect it. If you notice any of these signs, we welcome you to call our dental office in Alexandria to schedule an appointment. We’ll perform a thorough exam to find the cause of the problem. If you happen to need a root canal, we promise to recommend the best treatment possible so that you experience relief in no time. Accepting new patients from Alexandria, Old Town, and Del Ray.